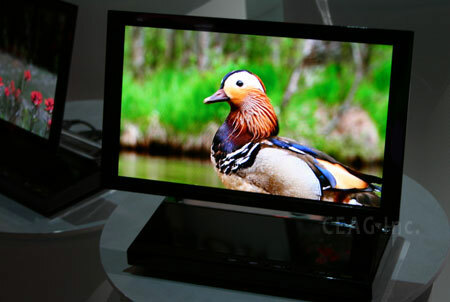 Plasma TV technology appears to be much more closely related to OLED TV technology than its rival LCD. This “future of TV” format has many similarities with plasma technique, as we will see below. OLED TV (organic light emitting diode) is the newest (and best) technology in the lively TV/display market and my opinion is that it will be a viable alternative to plasma TV and LCD TVs in the future. It amazes me that DLP was such a vaunted television format just a few short years ago and now, with the onslaught of lower priced 1080p LCD and plasma TVs, my prediction is that it will be no longer. In less than 2 years I believe there will be very few DLP or rear projection TVs available at all. But that’s another topic. LED TVs are a different form of LCD TV and are sometimes confused with OLED TVs, see our complete coverage of LED TVs here. OLED TV color information is produced using organic carbon-based compounds, which emit red, green and blue lights in response to electric current. OLED television is most similar to plasma technology in that there is no backlight needed to light the screen. OLEDs use a cathode layer to introduce electrons to the first layer of organic molecules. OLED TV panels come with either two or three layers of the organic compounds, which are located in one super thin layer of the “glass”. In a similar way plasma pixel cells containing rare natural gases come alive from electric impulses introduces to the by a TFT (thin film transistor). OLEDs have red, green, and blue organic light emitting diode material much the same way that plasma has red, green and blue phosphors. However, there is one very important difference in engineering the panel or glass. OLED TVs have one solid layer of plexiglass-like material which is extremely thin and light and contains all of the color compounds and TFT material needed. Therefore, the OLED panel is flexible (as in non-breakable) as well. Plasma panels are essentially a glass envelope, encasing the pixels cells that house the red, green, and blue phoshor. The glass envelope is what makes plasma panels heavy and breakable. Plasma flat screen technology consists of hundreds of thousands of individual pixel cells, which allow electric pulses (stemming from electrodes) to excite rare natural gases-usually xenon and neon-causing them to glow and produce light. This light illuminates the proper balance of red, green, or blue phosphors contained in each cell to display the proper color sequence from the light. Each pixel cell is essentially an individual microscopic florescent light bulb, receiving instruction from software contained on the rear electrostatic silicon board. Look very closely at a plasma TV and you can actually see the individual pixel cell coloration of red, green, and blue bars. You can also see the black ribs which separate each. Plasma TVs currently hold the best picture quality available in TVs above 37”. Plasma technology delivers a natural, realistic picture due in part to the rare natural gasses xenon and neon and the use of 3 phosphor colors blue, green, and rare – the combination of which can make any color in the prism. OLED TV creates color in a similar way using carbon-based molecules and thus are also pleasingly realistic. Both require an electric impulse, but much less so in OLEDs case. Due to superior technological efficiencies in manipulating lighter, simpler carbon based material, generating deeper blacks, brighter whites and all the gray scales in between should be a great strength of OLED. All this combined leads me to give OLED TV the edge in color accuracy though both technologies can produce all the colors in the spectrum. Though plasma has excellent black level currently (at least with the better manufacturers), OLED TV will surpass plasma in this area as well as dark matter detail. The stated contrast ratio for the new Sony OLED TV is 1 million to 1 while recent 1080p plasma offerings slid backward to 5,000 to 1. The summary of all of this is that OLED has deeper blacks, brighter whites and better grayscaling. OLED TV screens have near perfect viewing angle. OLEDs create light (are emissive) rather than block light. Every pixel is lit independently and that light will be seen from off axis viewing angles easily and accurately, much the same as plasma. As a result, expect perfect viewing angles of 170 degrees. Plasma screens also have emissive light through each pixel and perfect viewing angles of 170 degrees. OLED TVs and monitors will have the advantage of no screen burn in. OLEDs are currently used in cell phone and PDA displays so can obviously be manufactured for small applications. OLEDs will have a challenge getting large, but computer monitor applications aren’t much of a stretch. The resolution and picture quality there could get a huge shot in the arm from OLED. As well, there are no problems with burn in. Longevity is the only current problem. Plasma technology has increased anti burn in tactics as well as computer and static signal handling. There are still issues with each depending very much on the model and manufacturer. For example, most EDTV plasma televisions do not handle a computer input well and product a very jaggy image when viewing static images from same. Users may want to consider an commercial version plasma display if their application calls for a lot of computer use. Plasma displays do not suffer motion lag at all even at 60hz refresh rate the response times are fast enough so that the human eye cannot see any motion blur. OLEDs response rate is even faster than plasma but there is no motion lag or trailer effect in either. Altitude is not an issue for OLED TVs since there is no pressure build up from air pockets in the solid panel substrate. This is not the case for a plasma TV. The display element in plasma TVs is actually a glass substrate envelope with rare natural gases compressed therein. So, at high altitudes (6,500 feet and above), an air-pressure differential emerges, which causes plasma displays to emit a buzzing sound due to the lower air pressure. This noise can sound rather like the humming of an old neon sign. NEC has been effective in producing several plasma models that are rated to 9,500 feet. ADVANTAGE: OLED, at 7500 feet and higher. OLED televisions utilize slight electric currents to excite a combination of organic phosphorescence encased in a plastic substrate. OLED needs very little power to operate so in theory should last for a very long time as the parts are not taxed significantly. Here’s the catch, the blue organic phosphor LED compound has a short life (a guess is 7,000 hours). The red and green material may not last more than twice as much longer. Those first OLED displays will be an experiment with regard to longevity. Plasma, on the other hand, utilizes slight electric currents to excite a combination of noble gases (i.e., argon, neon, xenon), which glow red, blue, and/or green. This is an essentially active phenomenon, so the phosphoric elements in plasma displays fade over time. Many manufacturers state a new half life of 60,000 hours. While I am skeptical of this spec, I do believe plasma displays will outlive their necessary life. Some new technology such as OLED will have come along long before current plasma TVs die from phosphor fade out. As far as we know, there is no big concern with OLED TV with regard to burn in. It’s too early to tell at this point whether there will be an etching problem with the organic molecule material once larger displays are manufactured. With plasma displays, static images will begin to "burn-in," or permanently etch the color being displayed into the glass display element. The time it takes for this to occur depends greatly on the anti burn-in technology of the manufacturer. Recent improvements by plasma manufacturers have certainly extended the time it takes to burn in a plasma pixel cell. In the past I was concerned to place a DVD on pause 15 minutes. Now, many of the enhancements such as better green phosphor material, and motion adaptive anti burn-in technology are greatly reducing the risk of burn in. Currently the sole OLED TV being offered, the Sony OLED XEL-1 television is 11” and $2499. One of the big questions surrounding OLED TVs is whether or not Sony and Samsung can produce them in quantity, at the larger sizes, and competitive prices. Given the strength of LCD at the lower size ranges, this will be a challenge. However Sony has one surprise on this production run in that auto giant Toyota is teaming up them to produce the OLED displays. Creating a blue LED that lives a long life may be one of the keys. As a flexible technology, requiring plastics rather than glass as plasma does, this may be the most adaptive display technology we have seen. Prices will only come down as production rises. Plasma manufacturing of course is very streamlined after years of practice. I believe there is a bottom to how low plasma TV prices can go based on the expensive plasma display element (glass) manufacturing process. However, with 50” plasma TVs now selling for $1600, plasma is well established at the larger sizes. LCD, though inferior in picture quality overall is an easier and cheaper technology to manufacture as evidenced by all the Chinese knockoff brands. It’s harder to mess it up terribly. Plasma technology has always used a lot of power to generate electric pulses to each and every pixel. Though there have been improvements it will not compare with OLED TV in this category. 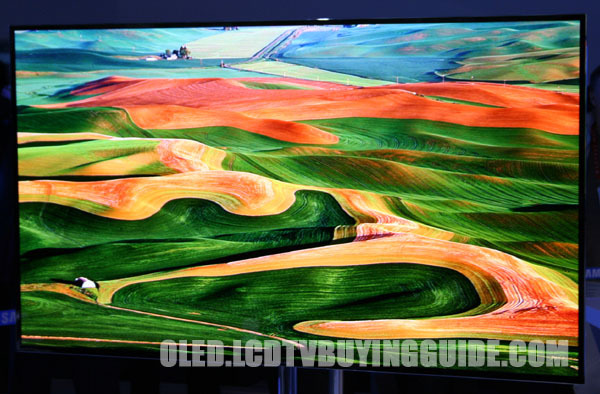 OLED TV will be the most energy efficient TV technology ever produced. It takes hardly any power to energize the organic light emitting molecules located in the emissive layer of the substrate. OLED televisions may one day be flexible, cardboard thin and large enough to cover an 9’ X 9’ wall. This is the greatest promise that they offer. Let’s face it, plasma and LCD TVs are already delivering stunning picture quality. The greatest attribute of OLED may be this flexibility, allowing the technology to be used for many new applications. The current Sony XEL-1 is only 3MM or an 8th of an inch compared to a couple of inches for a small LCD monitor. Oled TVs will not be price competitive for a year to two years. With the strong precense of LCD at the smaller sizes Sony will have to have patience and persistence to see this technology through to larger production runs – thus bringing down the price. $2499 for an 11” OLED TV is hard to swallow while the improvement over LCD and plasma is marginal. As well, the resolution on OLED TVs also have some catching up to do. 960 X 540 for the Sony XEL-1 isnt shabby but it could be better for that price.